Blue Mountain Transit is focused on providing excellent transportation services with the highest levels of customer satisfaction. With friendly staff and excellent communication skills, we’re sure you’ll be happy working with Blue Mountain Transit. Blue Mountain Transit is a small family run company. Operating in the beautiful Amador County since 1975. They are committed to our community and providing friendly and professional customer service. They work closely and directly with each customer to meet and understand all of their needs. They charge an hourly rate per vehicle, not per person. All vehicles undergo regular safety inspections, are CHP approved, and fully insured. Their goal is a safe and exciting trip for all of their customers. 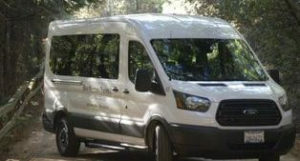 All vans are new models, and comfortably seat up to 14 passengers. They make sure all of our vehicles are serviced and cleaned before any transportation trips. Blue Mountain transit will charge a $250.00 cleaning fee if anyone should get sick inside or outside of the vehicle during your trip. Blue Mountain Transit requires a credit card to keep on file, until your trip is completed. While we understand you are going to have fun and enjoy wine, please, remember to drink responsibly. Blue Mountain Transit checks all ID’s before a winery trip.